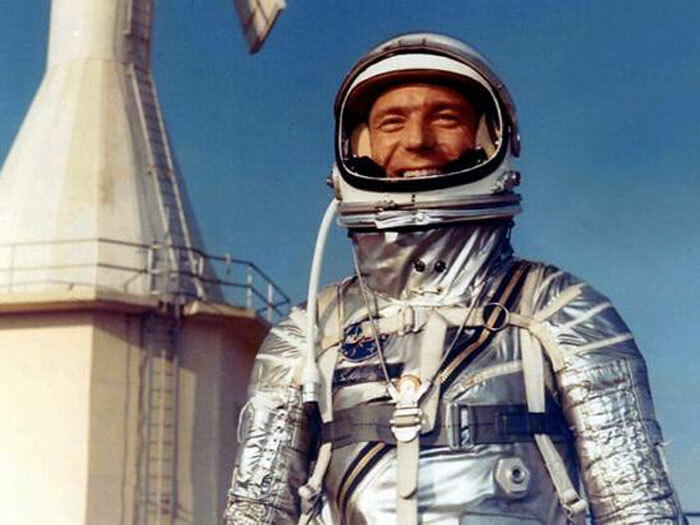 Scott Carpenter, one of the original members of the Mercury 7 - Nasa's first group of astronauts - has died aged 88, his family has announced. In 1962 Mr Carpenter became the second American to orbit the earth, piloting the Aurora 7 spacecraft through three revolutions of the earth. After retiring in 1969 he took up oceanographic activities. John Glenn, who flew the first orbital mission, is the last surviving member of the Mercury team. Scott Carpenter's wife, Patty Barrett, said her husband had suffered complications following a stroke in September and died in a Denver hospice. He lived in Vail, Colorado. Mr Carpenter, who was born in Boulder, Colorado, was commissioned in the US Navy in 1949 and served as a pilot during the Korean War. In April 1959 he was selected as one of the original seven Mercury astronauts and underwent training with Nasa, specialising in communication and navigation. During his own flight, Scott Carpenter's capsule landed 288 miles away from where it was meant to, leaving Nasa and the nation waiting anxiously to see if he had survived. The Navy recovered him from the Caribbean, floating in his life-raft with his feet propped up. 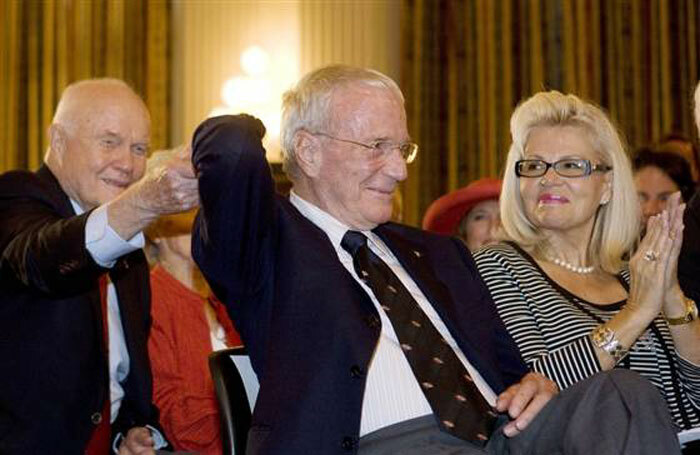 In a joint lecture with John Glenn 49 years later at the Smithsonian Institution, Mr Carpenter recalled his feelings from that time. Scott Carpenter did not go back into space but later joined the US Navy's SeaLab II programme and in 1965 spent 30 days under the ocean off the coast of California. After retirement he founded his company Sea Sciences, working closely with diver and researcher Jacques Cousteau. DENVER - The second American to orbit the Earth and one of the last surviving original Mercury 7 astronauts has died. Astronaut Scott Carpenter was 88 and made his home in Vail. His wife, Patty Barrett, said Carpenter died of complications from a stroke in a Denver hospice. As an astronaut and aquanaut who lived underwater for the U.S. Navy, Carpenter was the first man to explore both the heights of space and the depths of the ocean. Born in Boulder on May 1, 1925, Carpenter and graduated from Boulder High School in 1943. He then entered the Navy’s V12a flight training program at Colorado College in Colorado Springs. He spent the next year training in California and Iowa, returning to Boulder in 1945 to study at CU-Boulder. "In his two-decades long career as a Naval aviator, astronaut and aquanaut, Scott Carpenter brought honor and distinction to CU-Boulder while embodying the adventurous spirit of our nation,: said CU-Boulder Chancellor Philip P. DiStefano. "Our space program, and all space and ocean researchers everywhere, owe him a debt of gratitude. He will be sorely missed." In 1965 Carpenter took a leave of absence from NASA to participate in the Navy’s Man-in-the Sea Project as an aquanaut in the SEALAB II project off the coast of La Jolla, Calif. where he spent 30 days living and working on the ocean floor at a depth of more than 200 feet. Because of his groundbreaking deep-sea diving experiences with the Navy, Carpenter is hailed by many to be the first person to conquer both outer and inner space. In a 2012 interview with CU’s alumni magazine, the Coloradan, Carpenter spoke about his historic space journey. “I still remember what a thrill it was being up there -- I liked the feeling of weightlessness, and the view I had of Earth." Carpenter and the other Mercury 7 astronauts created the Astronaut Scholarship Foundation in 1984. The foundation now involves more than 80 astronauts, awards 28 $10,000 scholarships annually and has dispersed more than $3 million to promising students in science and engineering since 1986. Carpenter s remembered for his radio call "God speed, John Glenn," when Friendship 7 lifted off and Glenn became the first American to orbit Earth on Feb. 20, 1962. Carpenter was Glenn's backup pilot for that flight. Three months later, Carpenter became the second American in orbit, carrying out scientific experiments during a three-orbit flight that lasted almost five hours. He lost contact with NASA during the off-target landing but was found safely floating in his life raft 288 miles away from his intended splashdown point in the Atlantic Ocean northeast of the Virgin Islands. An air rescue aircraft didn't reach his location for 39 minutes. Scott Carpenter Park at 30th Street and Arapahoe Avenue, in Boulder, was rededicated last September to celebrate the 50th anniversary of Carpenter's flight. His grandparents also lived in Boulder on the corner of Aurora Avenue and Seventh Street and their home was the basis of the name he picked for his Mercury capsule: Aurora 7. May 24, 1962. 7:45:16 EST. The launch countdown proceeded almost perfectly. The launch vehicle used to accelerate Carpenter and the Aurora 7 spacecraft was an Atlas D.
The performance of the launch vehicle was exceptionally good with the countdown, launch and insertion conforming very closely to planned conditions. At sustainer engine cut off (SECO) at T+5min10sec, all spacecraft and launch vehicle systems were go and only one anomaly occurred during launch. Another transducer in the sustainer control circuit indicated that pressure had remained at proper levels so the switch did not actuate until the normal time after SECO. May 24, 1962. 12:41 p.m. EST. 19deg 29min North 64deg 05min West. Spacecraft overshot intended target area by 250 nautical miles. After landing, Carpenter reported a severe list angle on the order of 60 degrees from vertical and post flight photographs of the spacecraft taken after egress indicated approximately a 45 degree list angle. An Air Rescue Service SA-16 amphibian aircraft established visual contact with the spacecraft 39 minutes after landing (1:20pm) and the USS Farragut, located about 90 nautical miles southwest of the calculated landing position was first to reach the capsule. Carpenter was picked up by HSS-2 helicopters dispatched from the aircraft carrier USS Intrepid (CVS-11) while the destroyer USS Farragut (DLG-6) watched the Aurora 7 capsule until it could be retrieved with special equipment aboard the USS John R. Pierce about 6 hours later. Total time weightless 4 hours 39min 32sec. The performance of the Mercury spacecraft and Atlas launch vehicle was excellent in nearly every respect. All primary mission objectives were achieved. The single mission critical malfunction which occurred involved a failure in the spacecraft pitch horizon scanner, a component of the automatic control system. This anomaly was adequately compensated for by the pilot in subsequent in-flight operations so that the success of the mission was not compromised. Cabin and pressure-suit temperatures were high but not intolerable. Some uncertainties in the data telemetered from the bioinstrumentation prevailed at times during the flight; however, associated information was available which indicated continued well-being of the astronaut. Equipment was included in the spacecraft which provided valuable scientific information; notably that regarding liquid behavior in a weightless state, identification of the airglow layer observed by Astronaut Glenn, and photography of terrestrial features and meteorological phenomena. An experiment which was to provide atmospheric drag and color visibility data in space through deployment of an inflatable sphere was partially successful. The flight further qualified the Mercury spacecraft systems for manned orbital operations and provided evidence for progressing into missions of extended duration and consequently more demanding systems requirements.